Record rainfall from Hurricane Harvey brought five feet of water into First Presbyterian Church of Dickinson, Texas — along with some unwanted visitors in the form of fish and snakes. But the Rev. Kathy Sebring said it also has brought the blessings of Good Samaritans eager to serve as the hands and feet of God in the community. The church has long been actively engaged in several ministries to help the community of mostly low-income residents where it sits. With back-to-school clothing drives, a diaper ministry, ESL Bible studies, music lesson scholarships and a food bank run by M.I. Lewis Social Services in its fellowship hall, families have come to rely upon and trust the work of the local church. 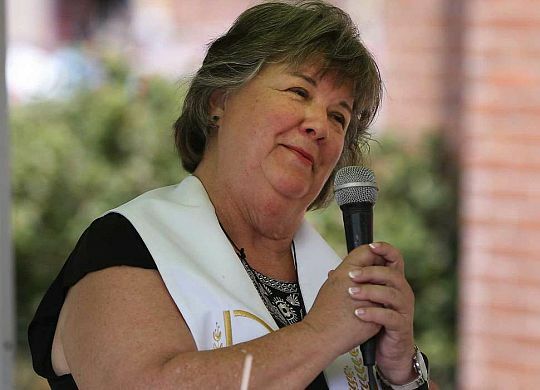 Now, First Presbyterian of Dickinson has added a new role in the community — hub of flood recovery efforts in the area. Members of the Fuller Center Disaster ReBuilders have been helping get the church ready for its new mission, one that will include helping the Disaster ReBuilders coordinate its recovery work in the region. Sebring is among community leaders that are working with various organizations and church to help the devastated community, including the Fuller Center Disaster ReBuilders as a leader in home restoration. The Disaster ReBuilders are working to establish a camp in the area, likely in Texas City, where they plan to begin hosting volunteer teams in a few weeks. That will be part of a very long-term recovery for the region. The spiritual needs, however, are immediate. “Everybody’s faith is tested,” she said, noting that concept was the subject of a devotion by Oswald Chambers upon which she reflected a few days ago. “We have faith, but until it’s tested and you go through the test, you don’t really own the faith. If you go through a disaster or crisis and you come through it, it’s yours. The Fuller Center Disaster ReBuilders’ Aaron Ratliff comforts someone outside of First Presbyterian of Dickinson. While the cleanup and restoration of her church is ongoing, the congregation took a major step in marching forward this past Sunday, Sept. 3, when it held services and communion on the church lawn. The church’s role as a community servant applies well beyond those who attend the church. Sebring noted that one family driving by during Sunday’s services stopped and asked if they could take part in communion. They told her they had not attended church in a long time but believe it is time for them to return. 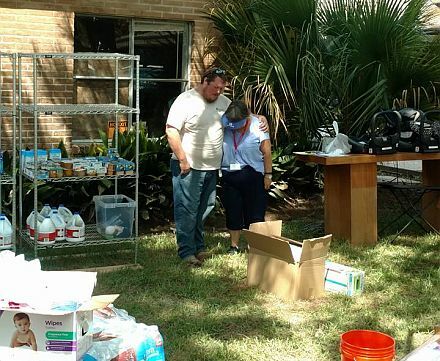 A trailer of food and other supplies brought by the Disaster ReBuilders’ Aaron Ratliff and Katy Summers has helped begin to restock the food pantry, the contents of which had to be discarded after being flooded. She also recalls getting a donation of fresh fruit from a local grocery store. She was heading out to deliver some when a family drove up in search of something to eat. She gave them the fruit. “The look on these children’s faces, it just broke your heart, but they were so excited,” she said. It is the children that Sebring is especially concerned about as the long weeks, months and years of recovery lie ahead. “Everybody that comes up and we give food, we ask if they’d like prayer,” she said. “So we pray with them, and they’re just in tears and then I’m in tears. I’m very, very concerned for the children. This is a low-income area already.